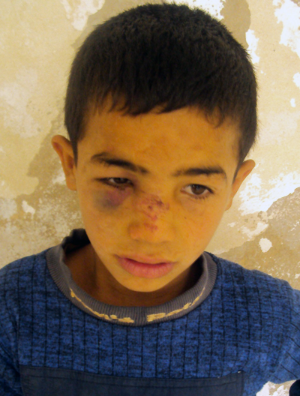 Israeli settler children between the ages of seven and ten attacked Farahat, 9, as he led the family donkey to a yard behind his house located next to an Israeli police station. Around 7 am, Farahat says that he was leading the donkey when about seven children, all Israeli settlers, approached and blocked him. He was pushed and the donkey’s leash was grabbed out of his hand. His father took him to hospital due to the swelling and bruising around his eye. He received first aid and an x-ray, and was released around 5 pm. 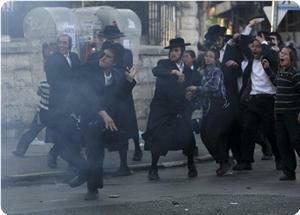 A Molotov cocktail was thrown at a settler's car south of Nablus on Sunday, Israel's army said. 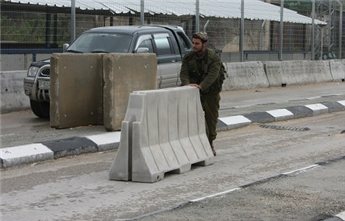 "Around 4.30 p.m. a Molotov cocktail was hurled at an Israeli vehicle passing near Huwwara and soldiers searched the area," an Israeli army spokeswoman said. 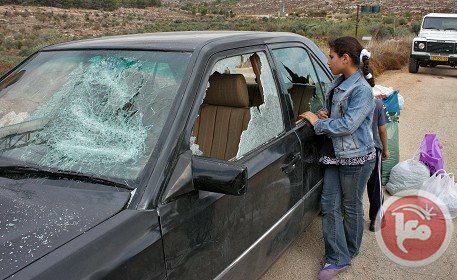 Jewish settlers have stoned and smashed Palestinian vehicles' windows in different areas south of Nablus, in the northern West Bank. Palestinian official Ghassan Daghlas, who holds the settlement portfolio for the northern West Bank, confirmed that settlers from "Yitzhar" settlement south of Nablus attacked and damaged more than 20 Palestinian vehicles. 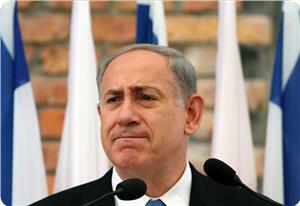 No injuries were reported among Palestinian citizens, he noted. Daghlas called on international organizations to put an end to the continued settlers' attacks against Palestinian citizens and properties. Settlers threw stones at Palestinian vehicles south of Nablus late Wednesday, damaging at least 20 cars, a Palestinian Authority official said. Ghassan Daghlas, who monitors settlement activity in the northern West Bank, told Ma'an that settlers from the notorious Yizhar settlement threw stones at passing cars on a nearby road. 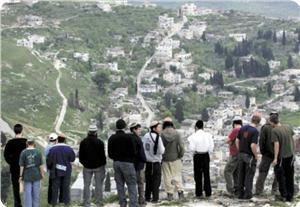 The Nablus district experiences a particularly high rate of settler violence. An Israeli settler on Wednesday ran over an elderly man in Qalqiliya northern occupied West Bank, causing him serious injuries. The old man in his sixties was seriously injured after he was hit by the settler's car in Funduq town in Qalqiliya before fleeing the scene, Palestinian police said in a statement. Local sources said that Abdel Hafiz Mohammad Tim was hit by a "Toyota Corolla" car with Israeli plates driven by a Jewish settler. He was transferred to an Israeli hospital for treatment. His injuries were described as dangerous, the sources added. Jewish settlers attacked on Monday three Palestinian citizens from Y'abad town south of Jenin while they were near the evacuated settlement of Homesh, south of Jenin and smashed their vehicle and tried to beat them up. A group of 30 settlers attacked a vehicle carrying three Palestinians near Jenin on Monday and tried to assault them but the car managed to escape the attack, local sources confirmed. 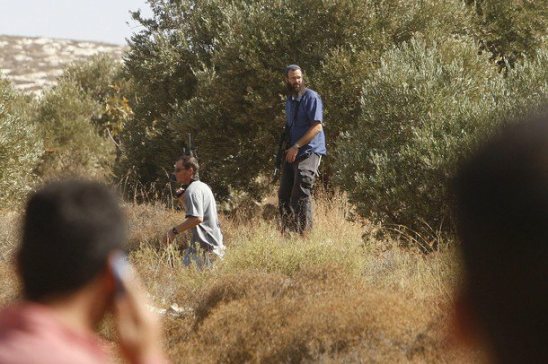 Ali Hamarsheh, Nasser Hamarsheh, 60, his cousin Montaser Hamarsheh were traveling to the former site of Homesh settlement when 30 settlers hiding behind olive trees attacked their car. Homesh settlement was evacuated in 2005 after the Israeli withdrawal from the Gaza Strip, however the Israeli settlers have established "Homesh First" group aiming at reestablish a permanent presence there. Two Israeli female settlers have distributed on Monday racist flyers against Arabs and Palestinians with logo of the extremist Kahane group near al-Asbat Gate one of the Old City gates in occupied Jerusalem. The Israeli police have arrested the two girls who came from one of West Bank illegal settlements, Israeli media sources said. Flyers belong to Kahane group were found in the possession of the two settlers, the sources added, noting that they were released on bail few hours after their arrest. Dozens of extremist Israeli settlers have stormed the al-Aqsa Mosque in East al-Quds (Jerusalem) under army protection and raised Israel flag inside the mosque, which is the third holiest site in Islam, reports say. 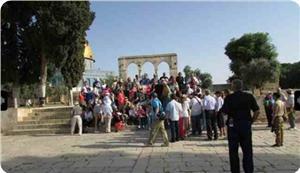 Local media reported that a group of settlers raised an Israeli flag while touring the mosque’s compound on Monday. Reports also said that after the incident, Israeli police closed Magharbe Gate that leads to al-Aqsa Mosque compound for visitors. Police forces are also said to have removed the settlers from the area. The latest incident comes after a similar event on September 18, when Israeli forces stormed the mosque compound, firing tear gas at Palestinian worshippers. Clashes reportedly broke out between the Israeli troops and the Palestinians after they attempted to prevent the worshippers, including women and children, from entering the mosque. In another similar incident earlier in September, the Israeli military used stun grenades to disperse Palestinian protesters inside the al-Aqsa compound after Friday Prayers, arresting 15 of them. The al-Aqsa compound, which lies in the Israeli-occupied Old City of al-Quds, is a flashpoint. The compound, known to Jews as the Temple Mount, is the holiest site in Judaism. It is Islam’s third-holiest site after Mecca and Medina in Saudi Arabia. This article was originally posted on PressTV. Palestinian sources have reported that several Israeli military jeeps invaded Beit Awwa town, south of the southern West Bank city of Hebron, leading to clashes with local youths. The sources said that dozens of youths hurled stones and empty bottles at the invading soldiers, and placed barriers obstructing the movement of the army in the town. The soldiers fired several gas bombs, concussion grenades, and rubber-coated metal bullets, in addition to rounds of live ammunition. No injuries have been reported. Also on Monday evening, several extremist Israeli settlers attacked three Palestinians in Ya’bod village, south of the northern West Bank city of Jenin. 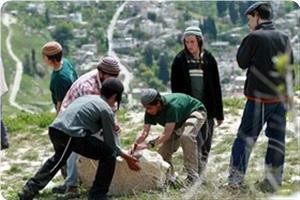 The settlers hurled stones at the Palestinians’ car nearby causing damage. The Palestinians were on lands where the former illegal Israeli settlement of Homesh once stood before it was evicted by the Israeli army in 2005. A month ago, Palestinian owners of the lands managed to obtain an Israeli court order allowing them to return to their lands and plant them. The settlers then decided to attack the land and install an outpost. In related news, soldiers invaded Be’er Al-Basha village, south of Jenin, and broke into a local store. 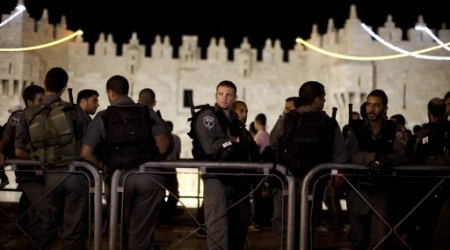 Israeli media reported that an Israeli stabbed a Palestinian woman in near Al-Aqsa Mosque's Damascus Gate. Israel's Channel 10 confirmed a Jew has stabbed Monday afternoon a Palestinian citizen in the Masrara neighborhood off the Al-Aqsa Mosque's Damascus Gate causing moderate injuries. The channel reported that the Palestinian citizen is from occupied East Jerusalem. Jewish extremist settlers stormed on Monday morning al-Aqsa mosque where they performed their rituals and raised the Israeli flag in the mosque squares. PIC correspondent confirmed that a number of Israeli settlers stormed al-Aqsa mosque under the protection of Israeli Special Forces and border guards. 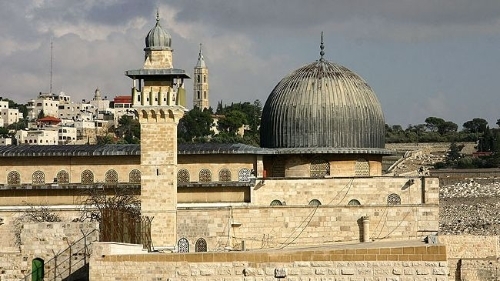 The settlers stormed the mosque from al-Magaribeh Gate and raised the Israeli flag at King Faisal Gate under Israeli forces protection, eyewitnesses said. Meanwhile, ten Israeli extremists including a rabbi performed their religious rituals at Rahma Gate protected by the Israeli police elements. Jerusalem Police has shutdown the Temple Mount area to visitors. The decision was taken after some 10 Jewish men began singing, dancing and waving an Israeli flag while in the area – in which Jewish prayer is forbidden for security reasons. The men were removed from the area and detained. Earlier three men were also removed after praying in the area. Jerusalem Police have taken in three Jewish men for questioning after the group prayed and bowed while on a tour of the Temple Mount. They were removed from the area and visits are continuing as planned. 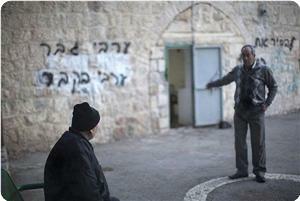 Praying in the Temple area is forbidden for Jews for security reasons. Israeli settlers have attacked Palestinians in a village south of the West Bank city of al-Khalil (Hebron), injuring two of them. On Saturday, Jihad Nawaj’a, the head of Susiya Village Council, said that around 13 Israeli settlers hurled bottles and stones at dozens of villagers, and assaulted several women and children. Following the Saturday attack, a 40-year-old woman named Sameeha Nawaj’a 33-year-old man, Nasser Mohammad Nawaj’a, suffered various cuts and bruises, medical sources said. The settlers also attacked shepherds in the area and chased them out of their lands. Israeli settlers, mostly armed, regularly attack Palestinian villages and farms and set fire to their mosques, olive groves and other properties in the West Bank under the so-called “price tag” policy. However, the Tel Aviv regime rarely detains the assailants. Dozens of Jewish settlers attacked on Saturday night and at dawn Sunday tens of Palestinian vehicles, in the vicinity of the city of Nablus in the north of the West Bank. 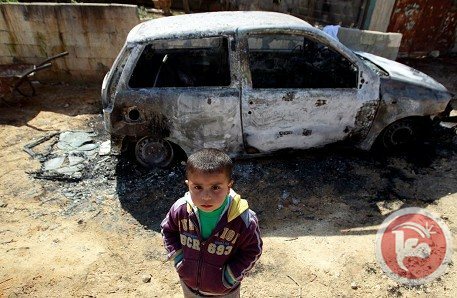 Ghassan Daghlas, official in charge of settlement file in the northern West Bank, said that more than 25 attacks on Palestinian cars have been recorded, mostly in the south of Nablus and in the main road between the towns of Ramallah and Nablus, pointing to the presence of a large number of settlements in these areas. Daghlas said in statement to Quds Press that a number of Palestinian civilians were wounded, and that several vehicles were damaged as the settlers threw stones at them. He noted that there is a significant increase in the pace of settler attacks, which have reached since the beginning of this year 589 attacks, including setting fire to cars and uprooting olive trees, compared to 370 attacks during last year. 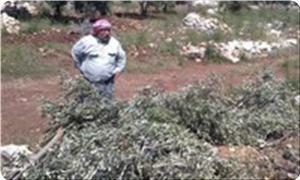 Meanwhile, youth activists, from several Palestinian towns to the south of the northern West Bank city of Nablus, announced the formation of popular groups to protect the olive harvest season in their villages, in light of the repeated settler attacks and the authority's failure to protect their lands. 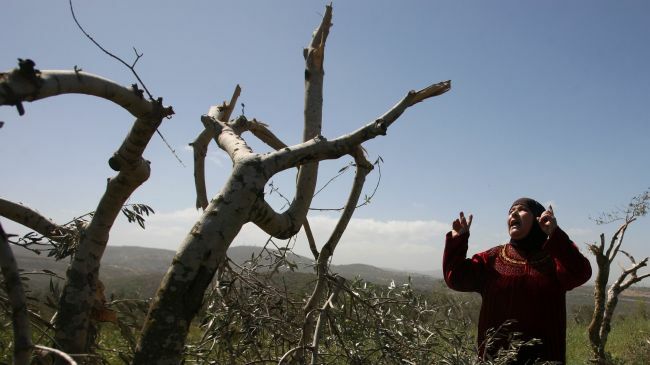 Those groups work on protecting the olive fields from the settlers' plans that aim to burn the agricultural lands and steal the olive crop, as what happened last year. They also seek to provide volunteers to help in the olive harvest in the lands located near the settlements of Yitzhar, Itamar and Barka, during the period of Eid al-Adha holiday. Tadhamun Foundation for Human Rights states that the recent weeks have seen a remarkable escalation in the attacks of the Israeli soldiers and settlers on Palestinian schools and students. The Foundation says in a statement on Sunday that these attacks include raiding the schools and destroying their contents, as well as detaining and assaulting students. It points out that the first of these attacks took place four months ago when the occupation bulldozers demolished the walls and the garden of Azzun Atma School in Qalqilya, for the expansion of the separation wall. 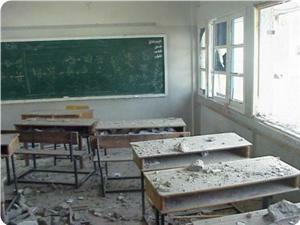 Tadhamun adds that last week has witnessed a remarkable increase in these attacks, when dozens of settlers stormed the Jalud School in Nablus, threw stones in the classrooms and smashed 6 vehicles that belong to the teachers. Hundreds of female students from Khader School in Bethlehem and Beit Dajan School in Nablus suffered from suffocation as the Israeli soldiers fired tear gas grenades at their schools. The occupation forces have also killed the student at Budrus School Samir Ahmed Awad, 17, in January after shooting him in the chest. The Magistrate court extended on Sunday the arrest of two young men; 23-year old Omar Yaser Khalayleh and 19-year old Mohammad Hashem Khalayleh until Tuesday, and released 20-year old Zeid Yaser Abed Rabbo Khalayleh and 25-year old Ra’fat Rawhi Amayreh with a bail of 1000 NIS and house arrest until Thursday. 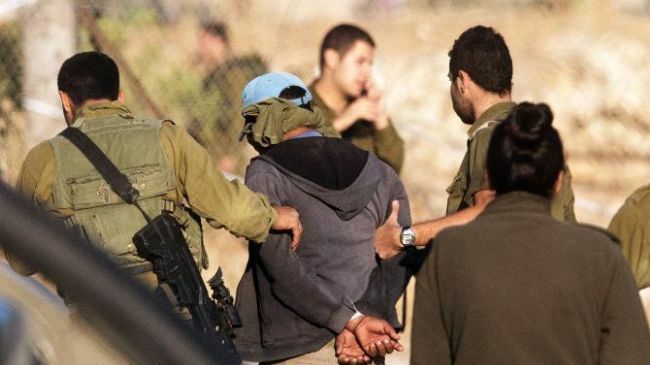 The Israeli forces arrested the four young men after midnight last Saturday after a group of extremist settlers assaulted them while being in Egged bus, line number 8. The families of the detained young men said that a number of extremists prevented the young men from riding and sitting in the bus for no reason. Another group of settlers then got on the bus from a station near Jabal Al-Mukabber and were holding pipes in their hands and used them to assault the young men in which clashes using hands broke out between the two sides. The bus driver called the police who called the ambulances to transfer the extremists to the hospitals for treatment and arrested the four young men and sprayed them with pepper gas and hit them with batons; note that the incident occurred at 12:30 a.m. Sunday morning. 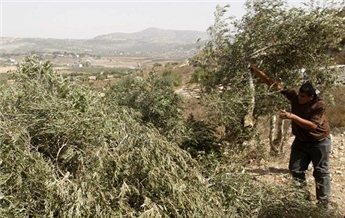 Palestinian medical sources have reported Saturday [October 12, 2013] that two Palestinians have been injured after being attacked by extremist Israeli settlers in Susiya village, east if Yatta town, south of the southern West bank city of Hebron. Jihad Nawaj’a, head of Susiya Village Council, stated that approximately 13 Israeli settlers threw bottles and stones at dozens of villages, and assaulted several women and children. The settlers also attacked shepherds and their flocks in the village, and chased them out of their lands. Medial sources said that a woman identified as Sameeha Nawaj’a, 40 years of age, and Nasser Mohammad Nawaj’a, 33, suffered various cuts and bruises. Eyewitnesses said that one sheep was killed due to the attack. 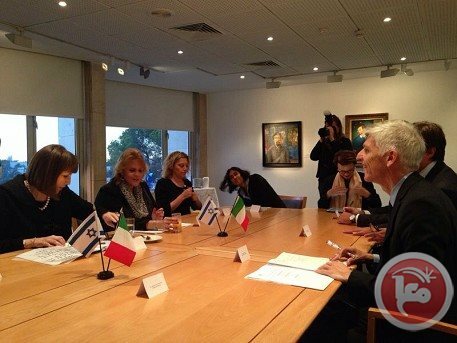 Italian Minister of Tourism and Culture Massimo Bray has denied allegations of acting in "solidarity" with Israeli settlers after meeting with a leader of the illegal Jewish settler community in the Old City of Hebron on Tuesday. A statement released by the Italian consulate denied these "specious" allegations, highlighting that the visit was not in "solidarity with the settlers" but was instead part of a mission to "contribute to Palestinian institutional building in the field of culture and tourism promotion." The statement added that the minister had visited the Old City of Hebron and had, "sorrowfully seen the consequences of occupation in order to give testimony about them," stressing that Italy's official position is that "settlements remain illegal under international law." Youth Against Settlements, a Palestinian activist group, earlier accused Bray of showing "solidarity with fanatic Israeli settlers" and of acting in "clear contradiction with EU regulations and declared policy to stop any support and/or cooperation with the Israeli settlements in the West Bank." "Bray is now seen as a partner in the occupation and oppression regime of the Israeli government and settler movement, which carries out human rights violations in Hebron on a daily basis," said a statement posted by the group on Facebook. The minister visited Hebron under the guidance of the Temporary International Presence in Hebron, a civilian observer mission that records violations of international humanitarian law and other incidents which occur in the city. During the tour, a representative of the Hebron Jewish settler community, American-born David Wilder, approached the minister and shook his hand. The minister subsequently continued on a tour with the settler leader, as seen in a Youtube video that has been leaked. The video shows him being led by Wilder through a museum and day-care center in Beit Hadassa, an illegal Jewish settlement in the center of Hebron's Old City. On his blog, the minister mentions both the tour of the Palestinian souq as well as the meeting with the Israeli settler. He mentions that the souq was "covered with iron nets to protect them from the rocks and garbage thrown from the windows of settlers." In the same post, he also mentions meeting with Israeli culture minister Limor Livnat, and discussing ways to increase "cooperation" between the two states. The minister did not appear to hesitate to meet with the representative of the settler community when approached. The Hebron Jewish community has referred to the visit as a "historic meeting." According to Israel National News, "Hebron's Jewish community welcomes such visits and hopes that other international leaders, particularly those from the EU, will follow in Minister Bray's footsteps, following his example, and meet with Hebron community leaders." Hebron is a frequent site of clashes due to the presence of 500 Israeli settlers in the Old City, many of whom have illegally occupied Palestinian houses and forcibly removed the original inhabitants. They are protected by thousands of Israeli forces. Settlers and Israeli forces regularly target local Palestinans for harassment, and many have been forced from their homes as a result. The Israeli military-controlled H2 zone includes the ancient Old City, home of the revered Ibrahimi Mosque -- also split into a synagogue referred to as the Cave of the Patriarchs -- and the once thriving Shuhada street, now just shuttered shops fronts and closed homes. Jewish settlers have forcibly confiscated land and evicted Palestinians from their homes throughout the Old City of Hebron. A 2006 survey by Israeli organization B’Tselem revealed that around 1,014 Palestinian homes in the Old City had been vacated by their occupants and more than 1,800 businesses had been closed as a result of the Israeli takeover. The Israeli army says it has arrested five Palestinians suspected of involvement in the killing of an Israeli settler in the occupied West Bank. Army officials said two men armed with axes and metal bars attacked the settler at his home in the settlement of Brosh in the northern Jordan Valley on Friday, AFP reported. The man named Sarya Ofer died, but his wife survived and only suffered minor injuries. Palestinian chief negotiator Nabil Shaath slammed the Israelis for conducting security operations in connection with the incident without prior coordination with the Palestinian authorities. "The Israelis should have come to us immediately asking for security coordination" following the latest incident, Shaath said. 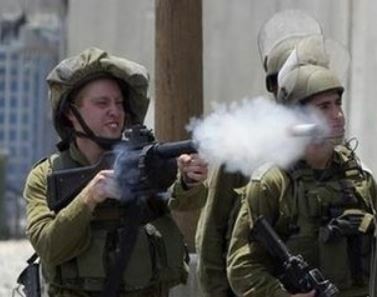 On Monday, Israeli forces stormed the Palestinian town of al-Bireh in central West Bank, firing tear gas and rubber bullets on the Palestinian residents. The attack came after an Israeli child was reportedly shot and injured by a mentally unstable person in the Israeli settlement of Psagot located near al-Bireh last week. Also on Monday, Israeli settlers attacked the al-Jalazun refugee camp north of Ramallah, throwing stones at residents and vandalizing their cars. The United Nations and most countries regard the Israeli settlements as illegal because the territories were captured by Israel in a war in 1967 and are hence subject to the Geneva Conventions, which forbids construction on occupied landas. 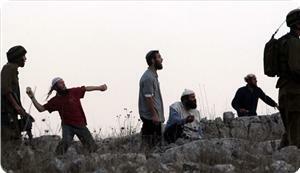 Dozens of settlers stormed on Friday Solomon's Pools area in the town of Khedr in Bethlehem south of the occupied West Bank, to perform Talmudic rituals there. 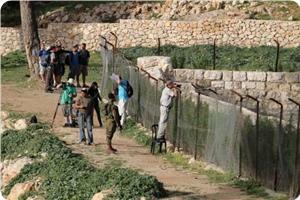 Ahmed Salah, coordinator of the Popular Committee against the Settlements and Wall in the town of Khedr, reported that nearly one hundred settlers from Efrat settlement stormed the archaeological areas of Solomon's Pools and Khirbet Qoton, under the protection of Israeli military forces. He said the settlers desecrated the place and performed Talmudic rituals there. Salah pointed out that the Israeli soldiers detained the photojournalist Samer Hamad and prevented him from covering the events in Solomon's Pools. 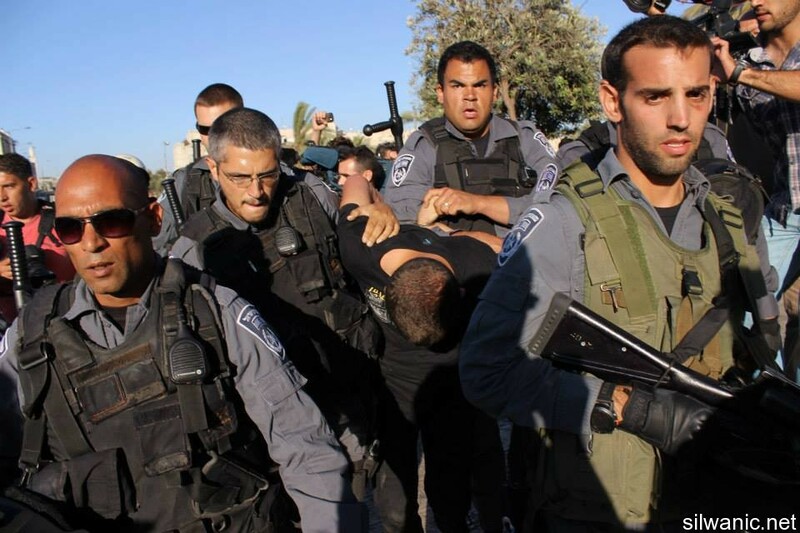 They released him after the withdrawal of the settlers from the area.